When Do You Leave Your Church? When is your church so corrupt, or powerless, or meaningless, or empty, or anything—that you can no longer stay? When must you break fellowship, disregard leadership, and abandon community? Or is there never an excusable time or situation? Right now I’m reading through the time in the 1930s when Bonhoeffer and his colleagues in the German Protestant church are being forced to choose between Hitler’s perversion of Christianity and what they know to be true faith. Some quite faithful pastors are very hesitant to leave their national church, while others—like Bonhoeffer—see early that there is no alternative but to leave. Bonhoeffer’s situation is perhaps different from where we might find ourselves in that he must deal with a national organization, whereas, we most often think only of leaving congregations. And yet as I write those words, I think of the growing number of members of churches of Christ who are leaving the heritage of their youth for everything from orthodoxy to Pentecostalism—but mostly just for what they perceive to be a lively fellowship versus a dying fellowship. In several conversations recently, Sherrylee and I have posed the following question for ourselves: if we had been common members of the church in 1517 in Wittenberg, would we have left our church to follow Luther’s teachings? Or would we have stayed and tried to preserve the unity of believers—which Luther actually did as well until he was excommunicated by his church. Does Jesus’ prayer for unity among his followers mean anything to us today? I know we all believe it does, but we have a terrible time defining that unity. Jesus described a united fellowship as built from all who “believe in me” (John 17:20), all who are “in us” (v.21), and all who have received His “glory” (v.22). These transcendent terms sound neither like the basis of fellowship nor like the points of contention that cause people to break fellowship today to me. Luther’s breach was within the existing church until he was cast out as an outlaw. Even then he himself did not establish a new fellowship. The political and social environment of the time forced people to choose whether they would be Lutheran or Catholic—not God. 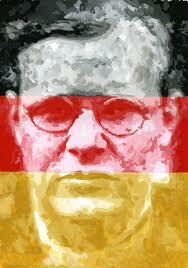 Bonhoeffer saw the German state church turned into an arm of a godless political machine. Jesus left the state church, so Bonhoeffer did as well. He followed Jesus—and so should we. Has Jesus left your church? If so, you should leave too! Have you been excommunicated because of your testimony—officially or unofficially? Then you have really no choice but to find a new community. I truly wonder though if my personal preferences, my personal irritations, my personal opinions are any reason at all to leave my church? I suspect that the part of Jesus’ prayer for unity that is mine to fulfill compels me/requires me to subordinate the petty rests of what are mine to the greater goal of the Greater Unity. How do you participate in Jesus’ prayer for unity among His disciples? If you cannot do what God is calling you to do, or be the person you think he wants you to be within an existing system, then you should find a place you can. As usual, this was thought provoking, and mirrors some of my recent thoughts on similar matters. I particularly liked the concept of lively fellowship v. dying fellowship, as a descriptor for what some young Christians perceive. My personal struggle has been exploring the difference between entertainment value and “fun” and spirituality. I’ve been tempted to leave congregations which promoted the entertainment side because it was popular, and seemed to neglect the more meatier matters of faith. Keep up the good work. The title of your post is an important question. When DO you leave your church? I think the approach is to do exactly what you did in this post as you consider Jesus and his desires. Not an easy question but an important one that more and more people are wrestling with.